BRUSSELS -- Two spectators were killed and 23 others were injured on Thursday when a car ploughed into the crowd watching the Queen's Day parade in a central Dutch city, Radio Netherlands reported Thursday. 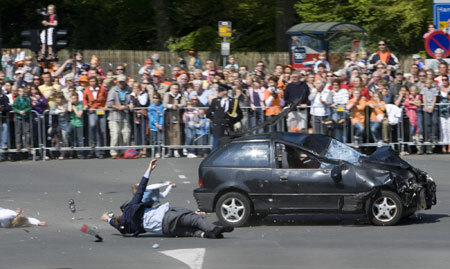 The car drove at a high speed when it hit spectators in the city of Apeldoorn, the report quoted witnesses as saying. Some of the victims were injured seriously. The black Suzuki Swift crashed into a monument and stopped. The injured driver was taken out of the car after his vehicle was cut. He was arrested and taken away for interrogation, the report said. The incident occurred just after a luxury coach carrying the Dutch royal family passed the spot. The royal family, waving to the crowd from their open-topped bus, witnessed the incident and were apparently shocked. It is not clear whether the driver was acting intentionally. He is reported to have crossed safety barriers twice earlier, driving at a speed of at least 80 km per hour. Some people suspected that he intended to attack the royal family. The mayor of Apeldoorn announced shortly after the incident that the festivities in the city were cancelled. In Rotterdam, the celebrations have also been cancelled, while the capital Amsterdam and other cities are studying the possibility of a cancellation. Queen Beatrix has sent a message expressing her sympathy to the victims. The government information service said the queen and her family are deeply shocked by the incident. Queen's Day is a Dutch national holiday which celebrates the birthday of the late Dutch Queen Juliana, mother of Queen Beatrix. This year marks the 100th anniversary of the birth of the late Queen Mother. The holiday is known for its free market all over the Netherlands, where everybody is allowed to sell things in the streets. The whole country is in a jolly, festive mood, and all kinds of activities are held in cities and towns, including children's games, music concerts and parties.